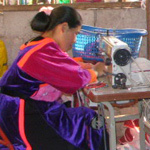 This shoulder bag is crafted by hand by the Hmong artisans with cotton. Intricate floral embroidery adorns the exterior. The interior is lined with cotton and has a zipped inner pocket to keep small items secure. 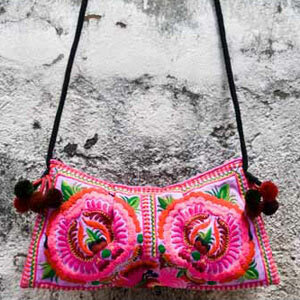 The artisans close the bag with a zipper and attach pompoms to the sides. 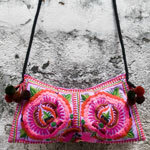 A stylish ethnic accessory to wear every day.